The 1860s were a turbulent time for Americans, as Civil War devastated the country and roiled California politics. California had been part of the country’s fractional debates from its start. When California became the 31st state in 1850, it tilted the number of free states over slave states by 16 to 15. California was still an unformed frontier region, with San Francisco by far the largest city in the West. California’s white population increased from about 15,000 in 1848 to 380,000 in 1860 which reflected immigrants coming for the great Gold Rush (1848-50), the silver bonanza of 1859 and the state’s many opportunities. Voters had lived in California less than 15 years and opinions on the Constitution, states rights, democracy and slavery reflected life in their original home communities. Debates in Congress and other forums over whether slavery should be expanded into new territories heated up in the 1850s. Zealous abolitionists wanted a complete end to slavery in America while most slave owners thought slavery should have no restrictions. A number of compromises were tried but emotions ran high. Fear of possible slave insurrections was palpable, especially in the many areas where black slaves outnumbered the white population. In 1860 the south had 9,000,000 people, over 3,500,000 of whom were slaves. Northern population was 22,000,000. The question of whether or not new states should be free, allow slaves, or vote on the issue themselves (Stephen Douglas’s “popular sovereignty”) was a continuing Congressional and public argument. Such debates were exacerbated by the economic, cultural and social differences between North and South. During the Presidential election of 1860, southern leaders were primed to secede, even though Abraham Lincoln was a relative moderate on the slave question. Others who had competed for the Republican nomination were far more extreme than he -- one reason he was nominated. But clearly the new Republican Party opposed the expansion of slavery into the territories and the era of compromises had come to an end. Southern states began seceding in December, 1860. The Confederate attack on federal Fort Sumter on April 12, 1861 was the spark which began the war. California had many southerners who questioned the constitutionality of Lincoln’s opposition to secession and devotion to the Union. The state supported the Union when the Civil War began. California sent regular gold shipments back east, donated generously to the Sanitary Commission (19th century Red Cross) and replaced Union soldiers in the West with thousands of California volunteers. Some Californians also fought in the East. 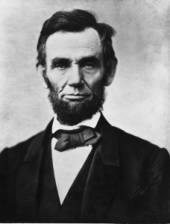 President Lincoln took several important actions which impacted California. His good friend, Edward D. Baker, led the state campaign for Lincoln in 1860 and later advised him on Pacific Coast issues. Lincoln signed the Pacific Railroad Act (1862) which ultimately brought the transcontinental railroad to California in 1869. And, in 1864, he signed the Yosemite grant, preserving the Yosemite Valley and the Mariposa Big Trees for posterity. The Homestead Act which passed in 1862 affected the entire West. Volunteers from California relieved U.S. regular soldiers throughout the West, freeing them to fight in the east. While the Californians fought no major battles, they guarded wagon trains, fought Indians and tended western forts. These soldiers also saw active combat when they defeated Confederate efforts to drive through New Mexico and Arizona and open a land route to California. According to Brigadier General Donald E. Mattson, Chief of Military History, California State Military Department: “Per-capita, California provided more troops than any other state in the nation. In the Bay Area, fortifications on Fort Point and Alcatraz were built to resist possible Confederate invasion by sea. The Camanche, an iron-clad warship, was launched on November 14, 1864, in San Francisco. One of 10 monitors constructed in 1863 in New Jersey, the Camanche was shipped to California in pieces and re-built for use in the Bay. San Francisco subsidized the building of what they called “our monitor” as the Civil War drew to a close and viewed themselves as integral to the war effort. Joseph Wilkes, a 17-year old from the Tassajara Valley, enlisted in the U.S. Army in 1863 and was assigned to Company K, 6th Infantry, California Volunteers. This was particularly interesting since his father Albert Gallatin Wilkes was a strong Democrat and did not support Lincoln’s efforts to preserve the Union. The family came from the slave state of Missouri and two of Albert’s brothers fought for the Confederacy. Joseph was served in the military for two years and helped guard the gold shipments which were sent east in support of the Union. Volunteers went east at their own expense to fight under the Massachusetts and other flags. One group was called the “California 100” with a banner, or guidon, which showed a grizzly bear. Ultimately, a total of 500 “California 100” troops participated in more than fifty Civil War engagements from Charleston to Appomattox. In addition, Union Colonel Edward D. Baker led another California and Oregon Regiment (part of a Philadelphia Brigade) until his death at Ball’s Bluff October 22, 1861. These soldiers received little credit as Californians for their service, but they were known to have been good fighters who helped withstand the brunt of Confederate General Pickett’s charge during the Battle of Gettysburg. "…all of a sudden it became a hand-to-hand affair. It was soon evident to (Captain J. Sewall) Reed that he was in for a whipping, and his men began breaking through the fences and into the field, but fighting all the while. His Californians, especially notoriously good fighters, were standing up to the rack like men, dealing out to us the best they had. They rallied at every call on them and went down with banners flying." -John W. Munson, Commenting on the California 100 (Company A, Second Massachusetts Cavalry) from Reminiscences of a Mosby Guerrilla. The charismatic Unitarian minister and orator T. Starr King spoke for the Union and raised funds for the Sanitary Commission in speeches throughout California. In the early 1860s, Californians took widely diverse positions. Some supported an independent nation on the Pacific Coast, others argued for secession, and King ardently crusaded for the Union. The precursor of today’s Red Cross, the U. S. Sanitary Commission took care of wounded soldiers during the Civil War. It gave women the chance to help the war effort on the battle field and in hospitals where, given the primitive medical knowledge at the time, even minor wounds were often fatal. A devastating 620,000 died in the Civil War, leaving practically no family untouched. Casualties amounted to over one million. People supported the Sanitary Commission as a way to help the troops. Rallies throughout California raised funds, with many San Ramon Valley donors’ names published in the Gazette. California contributed an astonishing twenty-five percent of all funds raised for the Commission, the most of any state. The San Ramon Valley produced cattle, hay and grain cultivation during the sixties and beyond. The villages of San Ramon, Danville and Alamo were small, with resident hotels, black smithies and general stores. Only Alamo and Danville had post offices. In 1862 ranchers had to cope with 49 inches of rain and huge floods which tore out the bridges, followed by two years of a devastating drought with less than 10 inches of rain. State-wide these weather variations mark the end of livestock grazing’s dominance and the beginning of grains as California’s main agricultural products. In addition, land titles in Alamo and Danville had not yet been settled, debates over secure ownership were still in the courts, and the final patent for the north part of the San Ramon Valley wasn’t signed until the 1870s. Jose Maria Amador’s rancho title had been concluded, settling San Ramon land south of today’s Crow Canyon Road. This patent was signed by President Lincoln on March 7, 1862. Some grammar schools had been constructed. The valley’s pride was the Union Academy, a three-story boarding high school on the border of Alamo and Danville. It opened in 1859 and was the first high school in the entire County. The building hosted large meetings, church services and school classes, with rooms for boarding students. A fire during the summer destroyed the building in 1868. In Contra Costa County there were some hot political disputes which were recorded in the weekly Contra Costa Gazette. A Contra Costa Guard which opposed secessionists in the County was formed in September 1861and was part of the First Cavalry Regiment, Second Brigade of the California Militia. Sixty-three men signed up. Many in the San Ramon Valley were from the southern states of Kentucky and Tennessee and the slave state of Missouri, while others hailed from Massachusetts, Illinois and points north. U. S. Senators -- Californians skipped the Territorial stage of government entirely. The 1849 Constitutional Convention had one section which forbade slavery in the new state, stating “Neither slavery nor involuntary servitude, unless for the punishment of crimes, shall ever be tolerated in this State.” Miners were a major voice for a free state since they objected to owners bringing their slaves to work the mines. The issue of whether or not slaves became free when they traveled to a free state was one which federal laws covered. Slavery existed in California for years; there were even slave auctions in Sacramento. The California Fugitive Slave law in 1852 mandated that runaway slaves must be returned to their masters which re-enforced the concept that African-Americans were property, even in a “free” state. Freed blacks came to the Gold Rush and many enslaved blacks worked to pay for their freedom in California. They also raised funds to free their families in the south. Nevertheless, it was clear that freed blacks were not viewed as equals in California. In this era they were unable to vote, testify in court or send their children to public schools. Slaves or “servants” in California and the nation were finely freed when the 13th Amendment was passed in 1865. After successful lobbying in Sacramento, the right for California blacks to testify in court was passed in 1872 and segregated schools for blacks were ended in 1880. Andrew Inman married Ann Young and brought her mother “Aunt Sallie” Young to live with them. According to the 1860 census, their household included Jane Young, age 50, a black house servant. According to Smith, Mack also barbequed at religious camp meetings in Alamo during the 1850s. As a growing boy in those years, Smith tended to remember food. When President Lincoln’s Emancipation Proclamation took effect on January 1, 1863, it freed slaves only in the seceding states. However, the Proclamation set the path for total emancipation in the country. On January 31, 1865, after intense lobbying by Lincoln, Congress passed the 13th Amendment to the Constitution which abolished slavery nation-wide. The final state ratified the Amendment on December 6, 1865. Two early settlers, brothers Daniel and Andrew Inman, were important leaders in the community. They lived and ranched in Green Valley where Andrew had donated the land for the first Green Valley Grammar School. Andrew represented the County in the State Assembly in 1856 and the State Senate from 1860 to 62. Daniel Inman, a lifelong Democrat, was also interested in politics and was respected as a man of probity and generosity. The town was named for him in 1858 after he bought 400 acres along today’s Diablo Road and Front Street. In 1863, he married Josephine Jones of Alamo, who was born in California after her parents (John M. and Mary Ann Jones) had traveled over the Sierras in 1846. Andrew and Dan Inman appeared regularly in Democratic Party and Democratic County Convention reports in various Contra Costa Gazettes. In 1863, Dan was nominated by the County Democratic Convention and ran for Sheriff. But it was the middle of the Civil War and Republicans, called the Union Party then, made the election case that to vote Democrat would be disloyal. He lost the election to J. J. McEwen, 1006 to 528 on September 2, 1863. Another set of Democratic brothers, John M. Jones, and his older brother Nathaniel, lived in Alamo and Lafayette, John M. and Mary Ann Jones had moved to Alamo in 1851 with their family and he was an active Democrat. He was the first Alamo postmaster and held several other County posts. In the September 2, 1863 election he ran for Assessor as a Democrat and lost 1009 to 515. Other valley Democrats included August Hemme, William Norris, Albert G. Wilkes, Felix Coats, Golder Field, Van Hayes, Edward Sturgeon, and Jesse Bowles. Republicans in the valley supported Lincoln and the Union and raised funds for the Sanitary Commission. E. H. Cox, who hailed from Indiana and was the father-in-law of R. O. Baldwin and William Meese, chaired the County’s Union Republican Convention in 1864. A huge Union rally was held in Danville in Flournoy’s field (around today’s Danville Oak) in 1864, which was covered extensively by the Gazette. David Glass was a County delegate to the Republican State Convention in 1864, pledged to Lincoln. Family lore says that, after Lincoln was elected in 1860, Glass left the Democratic Party and became a Republican, setting the party affiliation for Glass descendents from then on. When Charles and Cynthia Wood moved to Sycamore Valley in 1862, daughter Charlotte later wrote: “It being early Civil War times, there were many sympathizers with both the North and the South, and naturally there was a little hesitancy in meeting new comers, so no one called on Mother during her first six months here.” The Woods were “strong Northerners” who had originally emigrated from Massachusetts. Lincoln and Johnson Club members from the valley in 1864 included Glass, Charles Howard, James Foster, J. R. McDonald (Club President) and A. W. Hammett. Other active south county Republicans were the Crows, Levi and Sarah Maxcy, Henry Hawxhurst and R. G. Davis. Not far from the Woods’ ranch, in eastern Sycamore Valley area, two families took different sides -- the Maxcys from Massachusetts and the Coats from Missouri and Arkansas. Sarah Maxcy was an avid abolitionist and Union supporter who proudly flew the American flag in her yard, to make clear her position. Here is a story about the Maxcys and the Coats during the war written by Vivian Coats Edmonston from family memories. “Sarah was as firm an abolitionist as there was to be found in the Sycamore Valley. Legend has it that a group of young fellows of the neighborhood (another version says they were Coats boys) called on her one day with a request that she desist from flaunting the stars and stripes from the flag pole in the yard. Sarah Maxcy is represented here by a picture of Annie Oakley in her later years. “The third Fourth of July celebration I know of was held at Danville in 1864. I did not attend as my father was very ill and I was his nurse, but I knew of the extensive preparations. It was war time, and there was great excitement and much feeling between the Democrats and Republicans. San Ramon at that time was numerically Democrat. “Great preparations had taken place, speakers engaged and a chorus of singers had been chosen. I recall James Hardy, a workman in the carriage shop at Danville, had his singers practicing for over a week before. I had been spoken to as a reader of the Declaration of Independence, but could not attend and Finis E. Johnson, Preacher Johnson’s son and my classmate at Union Academy in San Ramon, was selected and he immediately began to read and commit the Declaration to memory. “I learned that there was a large assemblage, a speaker’s stand and seats had been prepared just at the locality where the San Ramon Valley High School is now located. Of course, there were many Republicans as well as Democrats in the assemblage. There was a family name Crow who lived in what was known as Crow Canyon on the road from San Ramon to Hayward. This family had been known to have very decided political opinions, strongly Republican. There was, besides the father, Jep, Granville, John, Francis and William Crow. “When the people had assembled, Mr. Hardy with his singers sang several patriotic songs, and the chairman called for the reading of the Declaration of Independence. As before stated, Finis Johnson had memorized the Declaration, and he came forward and began to recite. He had not proceeded far until one of the Crow family arose and in forceful language asserted “No secession speech shall be delivered here” and followed with more strong language. Prominent leaders in the valley definitely were on different sides. Who knows how the conversations went when they met? Many on both sides did not want to see brother fighting brother, which happened repeatedly as the war progressed. But the issue of slavery in America had been avoided for the most part by the Founding Fathers in an effort to bring the 13 colonies together. And it festered like a canker in the decades that followed. Since Danville was a hotbed of Democratic support, the Republicans may have set up this rally to get in their opponents’ faces. Most state officials were Democrats at the war’s start. In fact, in 1860 Abraham Lincoln took California by just over one-third of the total vote. He won the election largely because the Democratic Party had two candidates, Stephen Douglas and John Breckinridge. But, during the war years, Union Republicans held sway in California and, in 1864, the Lincoln/Johnson ticket easily defeated McClellan/Pendleton in the state. The Presidential election of November, 1864, showed south County’s Democratic sentiments. The Danville precinct -- which probably included San Ramon -- supported George McClellan over Lincoln. Perhaps one sees the Inmans’ hands in this. This cartoon has Lincoln saying “I have a little joke,” referring both to McClellan’s height and experience. “On the whole, the Union Party has great cause for rejoicing at the result of the election in our county and the same happy state of things seems to exist throughout nearly all the State, so much so that it is probable the total majority for Lincoln in California will exceed twenty thousand votes. Robert E. Lee surrendered to Ulysses S. Grant on April 9, 1865, marking the end of the great conflict. It had lasted 4 years with the loss of 620,000 lives. Grant offered generous terms to the rebels, in accordance with President Lincoln’s wishes, and sent them home with their horses and small arms. Less than a week later, on April 14, John Wilkes Booth assassinated President Lincoln. Northern leaders, charging that Booth’s mad act was a murder by Jefferson Davis’ agents, characterized it as part and parcel of the dying Confederate war effort. The country grieved as Lincoln’s funeral train traveled slowly to Springfield via New York and Chicago and was viewed by millions of people. Small groups of mourners gathered and bowed their heads as the train went though the countryside carrying “Father Abraham.” Lincoln’s plans for forgiveness and national reconciliation were left to others more interested in retribution. A year later, the loss of Lincoln was remembered in California’s San Ramon Valley during a Green Valley School picnic as reported in the Gazette. In the spring time of the year. So stout, so brave a tree. Has laid that good tree low. They ask not -- but why? " Lincoln has had more books written about him than any other figure except for Jesus Christ. The accomplishments of this self-made man, rising from America’s frontier to the Presidency, are legion and our fascination with him never seems to end. At the conflict’s end, thousands of war-weary, dislocated Easterners looked for new opportunities and moved to California. The state population swelled from around 380,000 in 1860 to 560,000 in 1870, helped by the newly completed transcontinental railroad. Over 100 Civil War veterans moved into the Tri-Valley, from Alamo to Livermore.